WE LOVE ART, SOUND, MUSIC, VIDEO. We are THE TINY STUDIO and we do acoustic music recording, sound design, pop production and multimedia creation. Centered around a small team of dedicated professionals, The Tiny Studio is a young company in the music industry with fresh ideas, always seeking for new challenges! We do mainly acoustic music recordings, sound designs, but also multimedia creations such as video, web design, graphic design and photography. The fact that we are tiny allows us to quickly shape and adapt our structure, team and equipment to precisely meet our client's requests. We simply want to respect time, budget and artistic visions of the people we work with. The Tiny Studio was created by Karl Ancia. Recording engineer at the national opera house of Belgium, Le Théâtre de la Monnaie, he has a great experience in surround sound recordings of opera and classical music ensembles for CD, DVD and live broadcast on TV or web streaming. 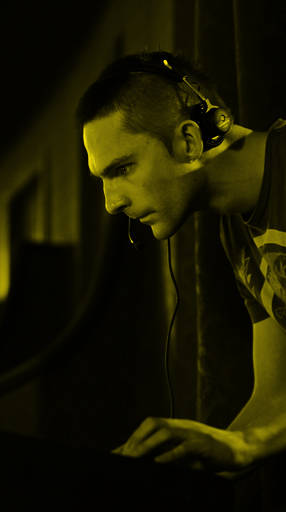 Karl works also as a sound designer and video engineer for theatre and opera productions. His personal taste for contemporary music made him work with various artists such as Leo Hussain, L'Ensemble Modern, or La Fura dels Baus with whom he realized the sound design of the acclaimed Le Grand Macabre opera. He also made the sound design for Cendrillon by Laurent Pelly, Pelléas & Mélisande by Pierre Audi, La Dispute by Benoit Mernier or Il Trovatore by Dmitri Tcherniakov... and was involved in the video of Cendrillon by Stefan Gögler or Ivo van Hove's Idoménéo. Classical or acoustic music recordings is our core business. 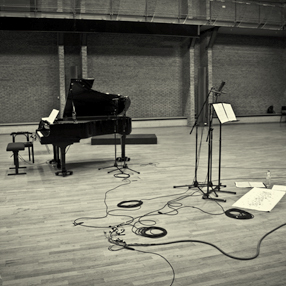 Our recordings reproduce with the upmost fidelity the sound of your instrument or ensemble. This being said, when desired, we love to test and create new sonorities with you. Contemporary music and new waves of composition, including electronic instruments, offer new possibilities of localization and soundscapes. 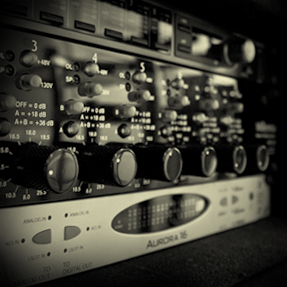 To obtain the best sounding recordings, we only work with carefully chosen high profile equipment. We record in digital with a high sample and most of the time, our recordings are in surround sound. We love to do that even if the final product is for now a stereo mix: we never know. Of course, we love to record live concerts. Our mobile recording set allows us easy and fast installation of a 64 tracks recording system in whatever places. Pop music contains all music genres that requires a strong production process like Jazz, Rock, Folk, Electronic... More than just a recording / mixing infrastructure, we offer a know-how and production services. Our goal is to make your music sounds the way you like it with the added value of professional advices on compositions or arrangements. Thanks to strong relationship with different studios, we can provide several kind of recording spaces. We love to find the right place with you wherever it may be. We only work with carefully chosen high-profile devices. We provide vintage mixing desks, great effects, backline equipment and top-quality microphones. And for live recordings, we have a mobile 64 tracks recording set that allows us easy and fast installation in any place. We are expert in sound design, music for film and foleys. We work with the same enthusiasm wether it is a 10 seconds corporate video or a entire movie. Sounds in video is certainly as important as the image. It brings the audience where you want to, create and emphasis their feeling. The Tiny Studio video department is plenty of new and fresh ideas to create, write and shoot music, artistic or promotional videos. We are equipped with DSLR cameras to shoot full HD at very high quality and with a very low cost. We have a complete editing & post-production facility to make it look fantastic. And with the help of sound designers we will make it sound better than you ever imagined. Simply driven by a passion for graphic design, photography and web, The Tiny Studio has now its own little design department. This is where we create simple, elegant and friendly websites using new HTML5 and CSS3 standards. And where we do nice photographies for your CD covers, your website. Recording softwares: ProTools / Logic studio. And many outboard, preamps and backline equipment available on demand. You want to buy a new vintage microphone but you are not sure of its quality, you want to update the equipment of your studio but is it worth the money? It's always good to have an objective advise on the subject and we have a long experience doing so. For studio owners or musicians, we offer personal training and advises to get the most out of your installation from Studio redesigning to overseeing the creation of a new private studio. For institutions involved or willing to in sound or video such as theaters, opera houses, schools... we can help you with facilities development but also with all the administrative and technical expertise to create legal and concise user requirement documents. The Tiny Studio is located in Brussels (Belgium), but we like to travel with our tiny equipment all over the place. Do not let distance separate us! All rights reserved. All materials on this site are copyrighted and may not be used in any way other than personal use unless authorized or stated otherwise by The Tiny Studio. Reproduction, modification or storage, either digital or analogue are strictly prohibited without written permission. Copyright © 2011 by The Tiny Studio.